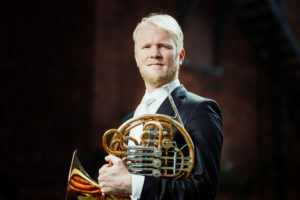 Christoph Ess (DE) has established himself as a significant voice in classical music and as one of the leading horn players of his generation. As a top prizewinner of several international music competitions he appears as both soloist and chamber musician all over the world. In 2017 he has been appointed Profes­sor for horn in the Musikhochschule Lübeck. His career started at the Musikschule Tübingen where he had lessons with Peter Hoefs. He studied in Basel and Stuttgart with Prof. Christian Lampert and Wolfgang Wipfler and received his diploma with the highest marks in June 2008 in Stuttgart. He received top prizes at national and international competitions such as the „European Classic Festival Ruhr”, the „loConcorso Internazionale per Corno di Sannicandro di Bari”, the „International ARD Music Competition” in Munich and the „Richard-Strauss Competition”. In 2007 he was awarded the first prize and no seven special prizes at the prestigious “Prague Spring International Music Competition”. One year later, he won the „Soloist Prize” of the Festspiele Mecklenburg-Vorpommern and received a scho­larship at the German Music Competition in Berlin in 2009. The “Orpheum Stiftung zur Förderung junger Solisten” supports him since 2011 with a debut in the Tonhalle Zurich. As a soloist he has performed with many of Europe’s leading orchestras including the Bavarian Radio Symphony, the Bamberg Symphony, the Berlin Radio Symphony, the Prague Philharmonia and the chamber orchestras of Munich, Stuttgart and Salzburg. In April 2007, he gave his debut at the Berlin Philharmonic Hall with the Deutsche Symphonie Orchester Berlin. In the upcoming season he will be Artist in Residence with the Philharmonie Neubrandenburg and will perform and record all Mozart horn concertos with the Folkwang Chamber Orchestra in Essen. Further highlights are concerts with the Tokyo Symphony Orchestra, the Kammerphilharmonie Bremen und the Rheinische Philharmonie Koblenz. He works with conductors as Paavo Jarvi, Jonathan Nott, Michael Sanderling, Yakov Kreizberg (f2011) and Rafael Frübeck de Burgos (f2014) among others. CD Productions with the labels GENUINclassics and PragaDigitals in the years 2012 to 2016 as well as productions for leading broadcasters as the Bavarian Radio, Radio DRS, Deutschlandradio Kultur and the Czech Radio highlight his success. In high demand as a chamber musician Christoph Ess has collaborated with many leading artists of today including Christian Zacharias, Andreas Scholl, the Fauré Quartett, the Zemlinsky Quartett, Quatour Ebène, Boris Kusnezow and Viviane Hagner. With his horn quartet “german hornsound” which he founded in 2010, he is a regular guest artist at Europe’s most prestigious music festivals. Christoph Ess was the principal horn of the Young German Phiharmonic and the European Union Youth Orchestra. He has also been performing with the Berlin Philharmonic, the Munich Philharmonic, the Staatskapelle Dresden, the Bavarian State Opera Munich, the Tonhalle-Orchestra Zurich, the Mahler Chamber Orchestra and German Brass. During the 2005/2006 season he held the position of the Third Horn at the Bavarian Radio Symphony before becoming the Principal Horn of the Essen Philharmonic orchestra. In August 2007, he joined the Bamberg Symphony Orchestra as its Principal Horn.